The refunds stem from a settlement with the operators of the Mobile Money Code scheme, which also used the names eMobile Code, Auto Mobile Code, Easy Cash Code, Full Money System, and Secret Money System. The defendants claimed that people could make substantial income using their “secret codes” online. In reality, these products were generic software applications for building mobile-friendly websites. As part of the settlement, the FTC will be sending 12,072 checks averaging about $53 to victims of the scheme. The checks will expire after 60 days. These are legitimate checks, and the FTC urges people to cash them before they expire. The FTC never requires consumers to pay money or provide account information to cash a refund check. 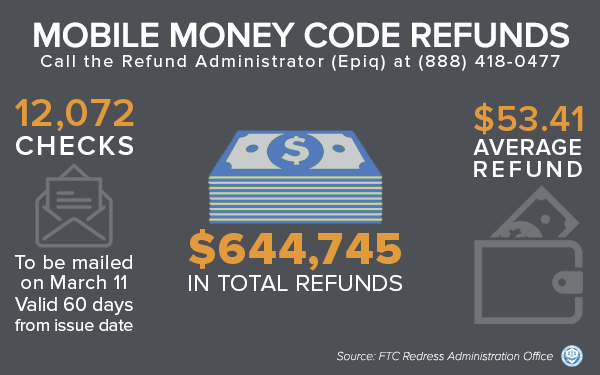 Consumers who have questions about the refunds should contact the refund administrator, Epiq Systems, at 1-888-418-0477. FTC law enforcement actions led to more than $2.3 billion in refunds for consumers in a one-year period between July 2017 and June 2018. To learn more about the FTC’s refund program, visit www.ftc.gov/refunds.